Important: The ICRS has made a major commitment to the Hyatt Regency Vancouver in order to secure a sufficient block of quality hotel rooms at competitive rates within the venue. We kindly ask participants and industry partners to book their hotel rooms at the Hyatt through the official reservation link below. There is no extra administrative charge for this service and we guarantee excellent discounted rates in this property. Hotel Rooms will be allocated on a first-come, first-serve basis. If you wish to extend your stay, the same discounted hotel rates are available up to three nights prior and three nights after the congress dates subject to room availability. 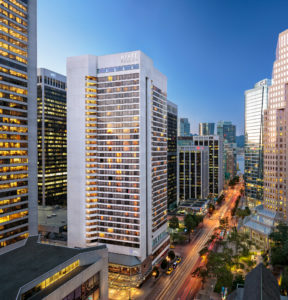 Located in the heart of downtown, Hyatt Regency Vancouver is the perfect location to stay for both business and leisure travellers. Guests will enjoy easy access to exciting attractions, like the unique shops of Robson Street and Stanley Park. From the moment you arrive at our downtown Vancouver hotel near the Vancouver Convention Centre, you will feel right at home. Welcome to Hyatt Regency Vancouver! Special Courtesy: As a special courtesy, the hotel offers exclusively to ICRS congress attendees, complimentary fitness club access and free high-speed internet access in the hotel rooms. For individuals online reservations will be accepted through www.cartilage.org. Online reservations should be submitted as early as possible. Rooms will be confirmed on a first come, first serve policy. Reservations thereafter are only confirmed upon availability and the hotel may charge a significantly higher rate. A credit card guarantee for the entire reservation period is required to confirm and secure your hotel room reservation. Please note that your Hotel invoice shall be settled directly to the hotel upon your checkout. For cancellations after August 30, 2019 and No-Shows: Charge of the entire reservation period. Hotel reservation changes must be directed to the Hyatt. Room night reductions of existing reservations are subject to the cancellation conditions as described above.